Dad ripped this letter open before he realized it was addressed to you. He has been busy this morning working on his walk around the garage. He ran out of gravel. As much as we had piled around I didn’t think it was possible. We are going out to a farm in this community to look for tocks for our rock garden when he gets through for today. He tried to get someone to come and put up guttering on the new part, but when they didn’t come he decided to do it himself. He will probably be all summer getting the things done he wants to do, but he will enjoy his work. As I mentioned in my last letter I may not come to Boston on the trip to N.Y. for the workshop June 4 to 7, since we will be coming the middle of July. Saw Mrs. Myers at the hospital yesterday. She was feeling very good and anticipates leaving the hospital May 3rd. We have invited her to come here for a day or so before she goes home. I have the sweater set = seat, cap and booties (didn’t make the little mittens) finished and Lea is making a carriage robe (or blanket) from several different colors of yarn. She is crocheting and had all the squares finished and was putting them together when she came here last week. We will bring all the things when we come including the outfit (stereo) John is giving you. I don’t know where we will carry out luggage, since we will also be bring the baby bed and a roll away bed. That buick should be able to hold what we have to bring. 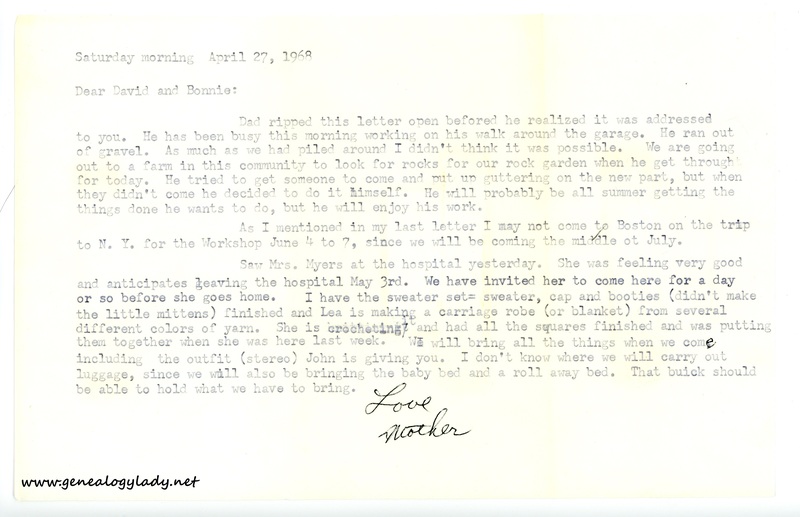 This entry was posted in Genealogy, Yegerlehner and tagged 1960s, Boston University School of Theology, genealogy, Gladys R. (Foster) Yegerlehner, Indiana, John F. Yegerlehner, Lafayette, Lena "Lea" (Keith) Gieselman, Massachusetts, Rockport, Roscoe S. Yegerlehner, Ruth M. Myers on April 20, 2017 by Deborah Sweeney.